The following case studies have been provided by NHS Trusts to show examples of how they have managed slips and trips. Please note that some of the Trusts have been renamed since these case studies were undertaken. Gateshead NHS Trust decided to provide slip-resistant footwear for their catering staff after carrying out risk assessments in their kitchens. Footwear was chosen carefully after extensive trials in the workplace involving the staff. Issues such as comfort and fit were considered as well as good slip-resistant soles. 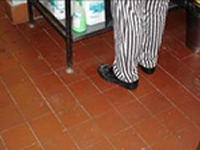 In some kitchens slip-resistant overshoes were provided to staff to reduce the risk of slips on old quarry tile floors that had worn smooth, until safety floors could be installed in a rolling programme of refurbishment. Accidents in the kitchens reduced because of the sourcing of better slip-resistant footwear. A new safety floor was installed at a later date to replace the old quarry tiles in the main kitchen. The Trust used to experience 4-5 slip incidents per year but since introducing the improved footwear and new flooring, slip incidents have been largely eradicated. 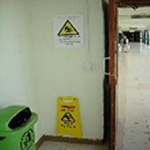 Health and Safety Managers at Lancashire Teaching Hospital NHS Foundation Trust identified a problem with slips from spillages on smooth vinyl floors in certain main corridors. After consultation with staff and cleaning teams, they introduced spill stations in corridors where the risk was highest. Each spill station consists of a wall mounted ‘Wet Floor’ sign accompanied by a large poster with an emergency contact telephone number which puts staff in touch with a 24 – hour cleaning team who attend quickly to deal with the spillage. Engaging staff support was crucial to the success of the initiative and an article in the staff magazine as well as a ‘spills/slips awareness day’ were organised, involving cleaning staff, a display stand, posters and competitions. All staff were reminded of the importance of contamination free flooring and encouraged to take responsibility for reporting spills and picking up litter. Monitoring of the spill stations has shown regular use of the facility and a reduction in the numbers of slips in corridors. Livingston NHS Trust were having problems at their main entrance on wet days. They extended the entrance area by three metres to provide a large external canopy and installed a three stage matting system. Different grades of matting were installed on the outside, transition and indoor areas. The first layer takes water to drain, the second layer takes water and dirt and the third layer is an absorbent layer which removes water and dirt. The new entrance ‘system’ is proving to be very effective at removing water and other contaminants from pedestrian footwear on wet days. A system is in place to deal with local contamination and is coned off immediately. Over a number of years only a few falls were recorded in the area.